"I've pretty much been in limbo my whole life," said Jessie Nunez, 24, who was brought to the U.S. at age 7 and lived most of her life as an unauthorized immigrant. 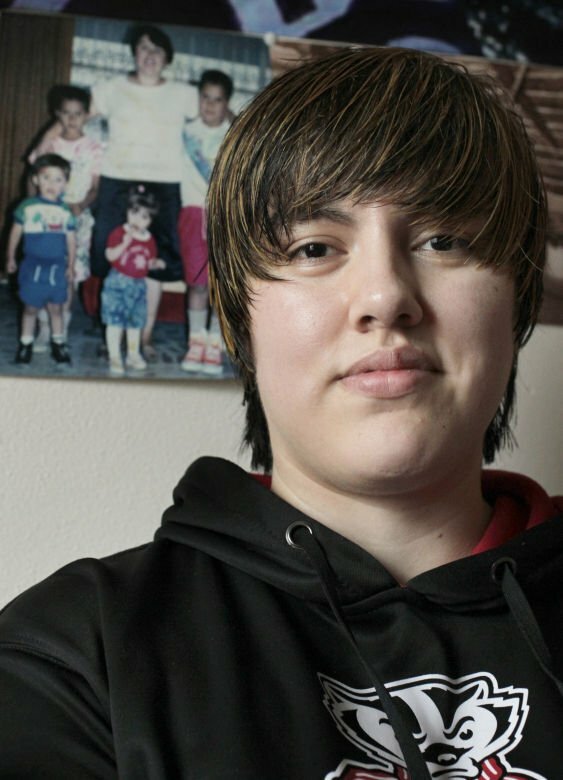 Behind Jessie Nunez on the wall of her Madison apartment is a portrait of her family before they came to the U.S. from Mexico. "It's really stressful to be in hiding," said Nunez, who until last month was an unauthorized immigrant. For most of her life, Jessie Nunez has lived in the shadows. She was 7 when her mother brought her to the U.S. from Mexico. Like hundreds of thousands of other undocumented youth, she feared deportation, so she kept to herself. Without legal residency, her options narrowed as she aged. She is now 24. Needing money, she used a fake Social Security number to get a job. Needing to get to the job, she drove without a valid driver’s license. “I didn’t break the law because I wanted to. I did it because I had no other options,” said Nunez, of Madison. On March 24, after nearly a year of waiting, she got the call that changed her life. Her federal application for Deferred Action for Childhood Arrivals (DACA) — a relatively new option for certain unauthorized immigrants — had been approved. It is not everything Nunez hoped for. It does not confer legal residency or provide a path to citizenship. But it does lift any immediate threat of deportation — that’s the “deferred action” part — and it permits Nunez to work legally in the U.S. for renewable periods of up to two years. “I had never experienced tears of joy until I got that call,” she said. She now has a legitimate Social Security number and can get a Wisconsin driver’s license. Deferred action is benefiting many people like Nunez. From June 2012, when the process became available, through the end of 2013, more than 500,000 young undocumented immigrants were granted reprieves, according to federal statistics. Of those, 4,954 were in Wisconsin. President Obama pledged comprehensive immigration reform when elected in 2008. That didn’t happen, so in the midst of his 2012 re-election campaign, he bypassed Congress and approved DACA by executive authority. It is not the Dream Act. That legislation, stalled in Congress, would give undocumented youth of good moral character a conditional path to citizenship if they complete college or serve in the military. Deferred action offers something less sweeping. Basically, it keeps U.S. Immigration and Customs Enforcement at bay as long as the young adult stays out of trouble. The intent, according to the White House, was to focus enforcement efforts on those who pose a danger to national security or public safety. Deferred action shields from deportation unauthorized immigrants who are at least 15 and who came to the U.S. before they were 16. They need to have been under age 31 as of June 15, 2012, have lived here since June 15, 2007, have no criminal record, and be either in school or have a diploma or GED. Critics viewed Obama’s move as a cynical ploy to woo Latino voters. Nunez, who cannot vote because she is not a citizen, said she recognizes the likely political calculation involved in Obama’s decision but is nevertheless grateful. “It really feels like I can breathe now,” she said. Nunez was born in Mexico City. In 1997, her mother, a cafeteria worker, brought her and her three older brothers to Chicago, where they had relatives. Nunez’s father, an electrician, remained in Mexico. They arrived on six-month visitor visas, attainable because Nunez’s grandfather — her mother’s father — is a naturalized U.S. citizen. They stayed after their visas expired, tossing Nunez into undocumented status. 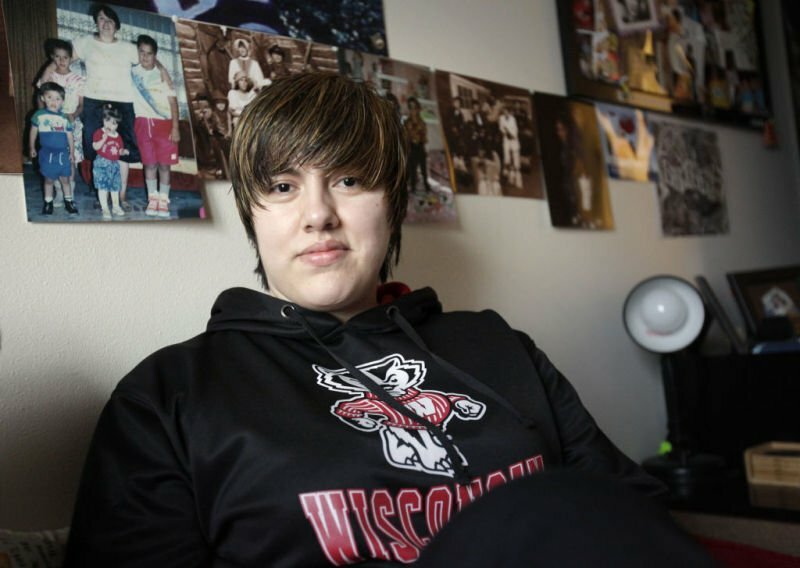 Feeling Chicago was unsafe, Nunez’s mother moved the family to Madison three years later. Nunez attended Madison public schools, graduating from La Follette High School in 2008, but barely. She often was unmotivated, she said, skipping school and getting into fights. She joined a gang. At the time, it seemed pointless to her to study because her future was so bleak, she said. It’s a mindset many undocumented youth find themselves in, said Mary Rhoades, a child and family psychologist in Madison who became a mentor to Nunez. The two met when Nunez was a student at Sennett Middle School and Rhoades worked there as a psychologist. Gloria Reyes, a Madison police detective and another mentor, often would chat with Nunez at Centro Hispano, a South Side community center, where Nunez took part in youth activities and Reyes is board president. Nunez would complain about school, and Reyes would buck her up. Nunez is ready to begin anew. She has a good start. Rhoades believed so strongly in Nunez that she paid the majority of the costs for Nunez to earn a two-year degree in criminal justice from Madison Area Technical College. Nunez flourished there, earning a 3.4 grade-point average and running for and winning a seat on the Student Senate. Nunez is considering a career as a police officer, but additional college courses in her field had been out of the question until she secured valid identification. Then there’s the issue of her current job. Last summer, Nunez was hired at a Madison call center, and she has done well there, often staffing the bilingual phone lines and helping train new employees. But she got the job by providing false information. She decided she would tell her employer of her new Social Security number. Two weeks ago, her stomach roiling, Nunez walked into her company’s human resources department and said she needed to change something on her application. The company kept her on. It was worth the risk, Nunez said. Many tears of joy have been shed the last few weeks — from Nunez, from her mentors, from her father in Mexico, from her mother, whom she remains very close to. Centro Hispano, 810 Badger Road, will host a free workshop from 3-5 p.m. on Sunday, April 27, on Deferred Action for Childhood Arrivals (DACA), a discretionary determination by the federal government to defer deportation action on certain individuals who arrived in the U.S. as children. The workshop will focus especially on people needing to renew their DACA authorization for another two-year period. Registration is requested but not required. Call 608-442-4012.